Five years after the African nation announced its first-ever uranium-mining program, the country is ready to begin mining for uranium — as soon as the economic conditions are right. In 2013, with the support of the International Atomic Energy Agency (IAEA), Tanzania launched a robust uranium-mining program in an effort to entice mining companies and learn how much of the valued energy mineral is in the ground. Following a series of exploration and surveying programs, Tanzania is on the cusp of extracting uranium from its first approved mine. “Five years on, a lot of progress has taken place,” Dennis Mwalongo, head of the department of ionizing radiation at the Tanzania Atomic Energy Commission (TAEC), told the IAEA. “The government has worked actively to implement the IAEA Uranium Production Site Appraisal Team (UPSAT) recommendations, which include developing appropriate legal and regulatory measures that comply with international requirements,” he explained. 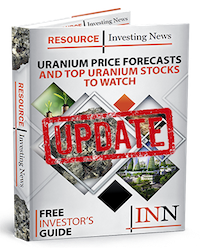 Unfavorable economic conditions and the stagnant spot price of uranium have kept shovels from breaking ground; however, in order to combat the country’s growing energy needs uranium mining may begin sooner than later. In fact, Tanzania plans to use uranium to produce electricity in accordance with the 2003 Energy Act, which allows the use of uranium as a supplier of energy. The progress made by the African country and other uranium producers will be top of mind at the upcoming IAEA International Symposium on Uranium Raw Material for the Nuclear Fuel Cycle, beginning June 25 in Vienna. To date, the Tanzanian government has completed the first construction phase of the TAEC laboratory complex, which will play a key role in the country’s uranium-mining future. The lab will provide radioanalytical and calibration services to support regulatory oversight of uranium mining in the country, as well as the wider region as a whole. Tanzania is no stranger to mining — in fact, it is Africa’s fourth-largest miner of gold. The country stands to gain a lot economically when it finally starts extracting uranium. “Currently, Tanzania gets six percent royalties on diamonds and gemstones and one percent on metallic mineral group, which include copper, gold, silver and platinum,” Dr. Boniphace Luhende with the University of Dar-es-Salaam School of Law told the press. Earlier this year, Tanzania established a mining commission to regulate the effective implementation of the provisions of its mining act. The newly formed commission will also be tasked with the granting of mineral rights such as mining licenses. The issuing of new mining licenses was suspended in July 2017 as the government began examining the country’s mining legislation in an effort to better monetize and promote the mineral sector. Presently, the most advanced uranium project in Tanzania, the Mkuju River site, has a measured and indicated resource of 36,000 tonnes of uranium and an inferred resource of 10,000 tonnes. Uranium One plans to operate the site and produce 1,400 tonnes of uranium annually. The spot price of uranium was up US$0.05 on Monday (June 18) and closed at US$23.40.